Discount Rey Del Mundo Cigars cigars store have the lowest online prices on cheap cigar. The origin of this peculiar brand dates back to 1848 when the Spaniard Antonio Allones set up his own tobacco business in Havana. 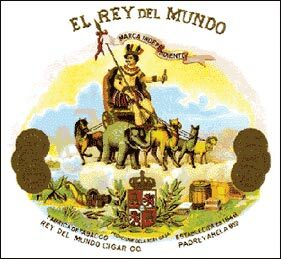 Only four decades later, in 1882, he made the registration of a cigar of premium quality and rate, under the extravagant name El Rey del Mundo (King of the World). Success came overnight and soon the factory was named after the mark, El Rey del Mundo Cigar Co. This brand name is one of the most popular and coveted Habanos amongst discriminating cigar smokers.